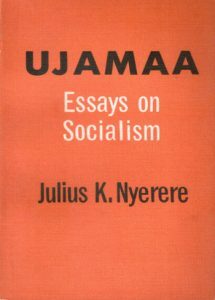 In Ujamaa: Essays on Socialism, Julius Kambarage Nyerere lays out the ideological framework, guidelines, and basic principles of the Tanganyika African Nation Union (TANU) underlying Tanzania’s commitment to socialism. The Arusha Declaration and the speeches and political writings by President Nyerere contained in this compact selection, provide such a framework. They provide an explanation of Ujamaa, or familyhood, and outline its policy implications in many important fields. This book thus helps towards an understanding of the moral principles, the aspirations, and the methods of Tanzanian political and economic development. Although primarily designed for the convenience of leaders, educators, and students in Tanzania, this collection is relevant to all oppressed people of the world. We found ourselves substituting Tanzanians with Africans, because the analysis by Nyerere is not only applicable for the development of Tanzanians, but the global African nation. These essays read like Paulo Freire’s Pedagogy of the Oppressed applied to the development of a nation. In dealing with quotidian problems brought on by centuries of colonial maldevelopment, Nyerere was able to give a very pragmatic analysis of national development not based on rhetorical bombast, but real praxis. This book is a must read by all serious people who truly wish to decolonize and rebuild. Note: Please note that this book is out of print, therefore, the price could be cost prohibitive for some. This book is essential reading, so we suggest people visit their local library if purchasing is not possible.